Raymond Yuan will be a senior this fall at St. John's School in Houston, Texas. He enjoys playing ultimate Frisbee, wrestling, playing cello, and, of course, math. As a junior, Raymond took both AP Calculus BC and AP Statistics, and will be studying linear algebra, partial differential equations, differential equations, and multivariable calculus next year. He hopes to someday pursue a career in engineering. 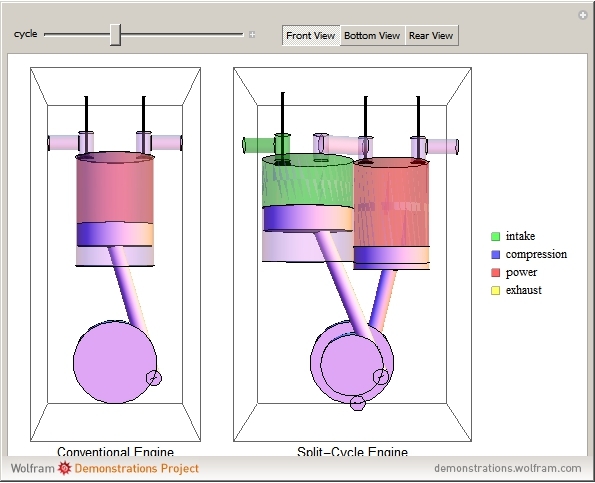 This Demonstration shows a model of a Scuderi, or split-cycle, engine compared with a conventional four-stroke engine. The difference between the two engines lies primarily in the revolutionary design; the conventional Otto cycle engine requires two revolutions of the crankshaft to perform all four strokes of the cycle, whereas the split-cycle engine divides these four strokes between its paired cylinders, performing both intake and compression in one and power and exhaust in the other, which allows for the completion of all four strokes in one revolution of the crankshaft. Furthermore, the split-cycle engine also transfers compressed air from the compression cylinder to the power cylinder, allowing for recovered breaking energy to be stored as compressed air.